Remember that a "gat" is a slang term for a gun in the 1930's. He must warn her. Placing the crystal lantern on a table, he pushed past the door into the murky twilight. 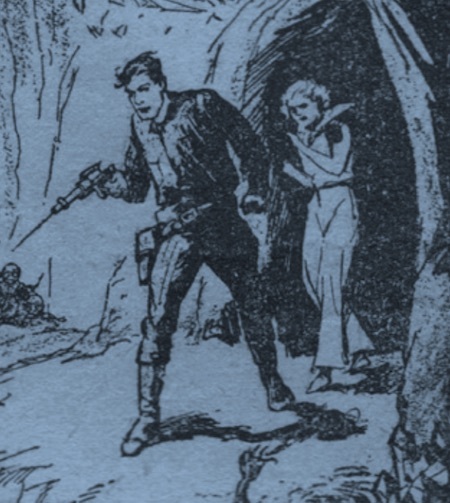 In his right hand he held a needle-beam gat, drawn from a holster at his belt. There was no use to take chances. Another green man leaped over the body of Oolanth, and again the needle beam spat its ray of death. Simultaneously the entire horde be- gan edging in. "Be ready to run for it!" shouted Omar. THEN he turned and shot the bluish needle beam down along the cavern floor. The slender ray bored into a dome shape plastered into the rock floor. For a moment it ate into the stonework. Then something erupted. A shrill whistle of escaping vapor followed a spray of rock upward. Before the astonished natives could attack, a mouth from the deep interior of Venus spat up, and the expanding gas created a column of ice that reared up like a cold flame. "Back!" cried Omar, grasping Enid by the arm. "It's carbon dioxide — pure carbon dioxide. And it's been under a pressure." Enid seemed paralyzed. She had seen ice formed by the release of carbon dioxide under pressure in liquid oxygen experiments. Heat was absorbed from the air, and the pure oxy- gen became a cold liquid. She saw it, an icy, silvery stream, trickling away from the mounting column of ice to run across the face of the dead Oolanth. The blue disintegrator beam traveled farther along the cavern floor, cutting crazy furrows to other mouths of cement, which shrieked with escaping gases and spouted up other tongues of frigid ice. Compare to the needle-gun from Lucky Starr and the Moons of Jupiter by Isaac Asimov (1957) and needle gun from Slacker's Paradise by Malcom Jameson (1941) and needle pipe from Beyond the Stars by Ray Cummings (1928).